Germany and the USSR employed a large number of captured enemy vehicles during WWII because of shortages in their inventories. Sometimes they also created hybrids by combining domestic and foreign components, and one example of this approach was the SU-76i self-propelled gun (SPG) used by the Soviets. Of interest, ‘i’ denotes Inostrannaya (or ‘foreign’). This vehicle based on the chassis of the Panzer III or StuG III featured a Soviet 76.2mm F-34 main gun. The Russians captured a large number of Panzer III/StuG III armored vehicles, many at Stalingrad, and Factory No.38 added an enclosed superstructure to the hulls. They were first issued to tank and SPG units in the fall of 1943. However, the following year they were withdrawn from frontline service and relegated to training use. One source estimated that 611 SU-76I SPGs were converted. 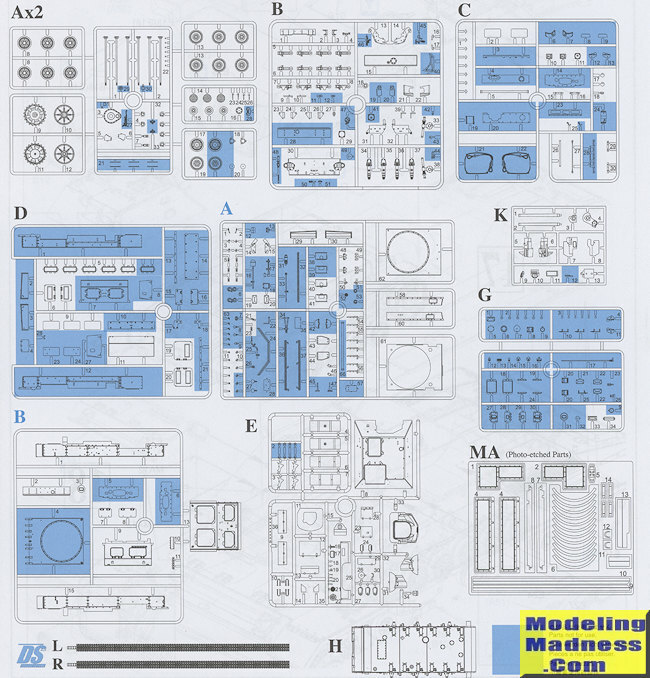 Not surprisingly, a large percentage of this kit is gleaned from those already produced by Dragon. 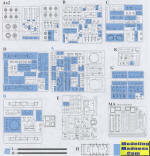 By this I mean that the Panzer III/StuG III chassis forms the basis for the kit. 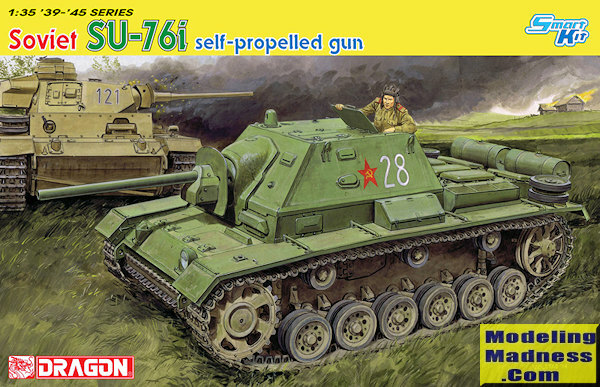 Dragon has also included the gun from their T-34/76 boxings. All new in this one is the fighting compartment and the storage bins that fit on the fenders. You also get the standard Soviet fuel drums with mounts. You might expect to have to do some modification to the base StuG/Panzer upper hull and fenders and you will. 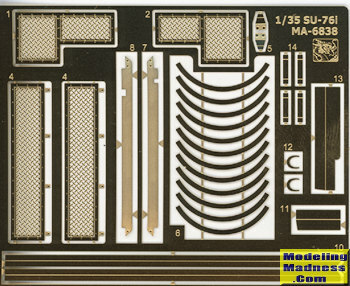 There are a myriad of mounting holes that will need to be filled in as well as some small details that will need to be removed. The biggest section that will have to be removed is a section out of the area where the turret would fit o n the StuG III. Dragon provides precise directions on just what has to be cut away for the new bits to fit in place. As is the norm, many of the various hatches can be posed open if one wishes. Since the 76mm gun is complete with breech, you may wish to leave one of the fighting compartment access hatches open to show this off. As usual, you do get a photo etch fret, mostly for the hull, and not quite as large as what you'd get with the standard panzer. Instructions are quite well done and a it busy in places. One needs to pay particular attention to these during the build to get all the modifications required to build this version. Markings are for six vehicles. One is a recaptured German vehicle in winter wash while the rest are all Soviet vehicles from the 1943/early 1944 time period and from unknown units. These are mostly in a khaki green shade, though some have other colors in a disruptive pattern on the upper surfaces. Decals are nicely done and provide what little markings these vehicles wore. 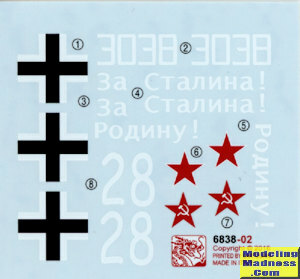 Here is a chance for both the Soviet and German armor fan to build the same kit. Thanks to the use of DS tracks, the parts count is in the mid 300s, so will build a bit faster than the usual with individual track links. In all, a nice addition to any WWII armor collection. Thanks to www.dragonmodelsusa.com for the preview kit. This one is currently available at your favorite retailer.